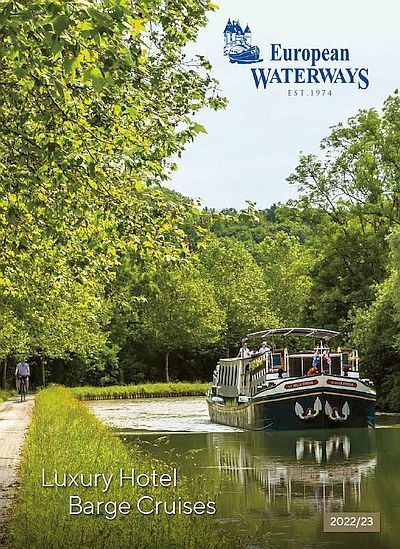 2019 marks 500 years since the death of famed polymath Leonardo da Vinci, and across the Loire Valley, France there are numerous events, parties and exhibitions celebrating 500 years of Renaissance history in the region, why not come and take part aboard a European Waterways cruise? The French Renaissance contributed to a revolution in world art, literature, architecture and science. France’s Loire Valley is marking the 500th anniversary of three major milestones that shaped the Renaissance: the death of Leonardo da Vinci, who spent his final years here, the start of construction of the Château de Chambord – the ultimate embodiment of Renaissance architecture – and the birth of Catherine de’ Medici in Florence, Queen of France by marriage to King Henry II, who reigned at the height of France’s influence. The tomb of Leonardo da Vinci, the original ‘Renaissance Man,’ is on display in the gardens of the Château d’Amboise, overlooking the Loire River. Guests aboard Hotel Barge Nymphea visit this extraordinary château and its gardens, as well as the Château du Clos Lucé, where he lived until his death. They also tour other royal residences, enjoy wine tasting excursions, and visit local markets and other attractions. Reminiscent of a classic yacht, Nymphea takes guests on an immersive journey that reveals the history, art, architecture, wine, and cuisine of the Loire Valley, which is often called the “Valley of the Kings of France.” The French court, held in towns along its namesake river, left behind some of the most magnificent royal residences in the world. Guests will visit the Château de Villandry, the last of the great chateaux built during the Renaissance, as well as cruise beneath the famous arches of the Château de Chenonceau, before enjoying a guided tour of its many lavish rooms and original artwork. The Cher River is close to some of the more significant Renaissance sites. Nymphea is one of the few vessels that can navigate it because of its shallow draft, our smaller groups also allow us to be more flexible with our itinerary to participate in the celebrations and visit these attractions across the valley. The anniversary celebrations of the French Renaissance in 2019 offer a unique opportunity to become immersed in the history of this region, but even beyond that, for those interested in their wines, the Loire Valley is actually a major growing area of France, so there’s plenty of wine to sip as you soak up the culture! Luxury Hotel Barge Renaissance also cruises in a more easterly part of the Loire Region, visiting several unique attractions, such as Gien, the home of Faience Pottery, and the world-famous UNESCO Heritage Site of the Château de Fontainebleau.